The former Swansea boss had only taken over during the summer. 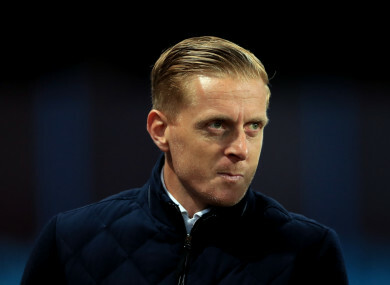 Garry Monk is looking for a new job. MIDDLESBROUGH SACKED MANAGER Garry Monk just hours after his Championship side’s 2-1 win at Sheffield Wednesday on Saturday. “Middlesbrough Football Club have parted company with manager Garry Monk,” the club announced in a statement following the come-from-behind win in Sheffield. “The club would like to thank Garry for all his hard work and dedication, and wish him all the best for the future,” the statement said. Middlesbrough’s first match without Monk is at home to Bolton on Tuesday. Meanwhile, Wolves have opened up a seven-point gap at the top of the Championship after they beat Ipswich Town 1-0 and Cardiff City lost 2-0 at Bolton Wanderers. Nuno Espirito Santo’s men have been the standout side so far this season and they are showing no sign of slowing down, as they head into the festive period in confident fashion. Bristol City were unable to build on their EFL Cup win over Manchester United with another victory, as they drew 1-1 at QPR, while Leeds United, 1-0 victors over Hull City, and Aston Villa hold on to their places in the top six, despite the latter relinquishing a 2-0 lead and ultimately drawing 2-2 with a Sheffield United side who had lost three in a row. Towards the bottom of the table, Burton Albion pulled themselves out of the relegation zone with a 2-1 win at Reading, securing victory late on through Tom Naylor. Middlesbrough also benefited from some late drama at Sheffield Wednesday, scoring twice in the final 19 minutes to win 2-1 and inflict a third successive defeat on their hosts. Derby County meanwhile recorded their fourth victory and fourth clean sheet in succession, beating Millwall 3-0 at home to close in on Cardiff. Email “The season of goodwill: Middlesbrough axe Garry Monk hours after victory ”. Feedback on “The season of goodwill: Middlesbrough axe Garry Monk hours after victory ”.